Home Carolynne SCAN meets Cassia! 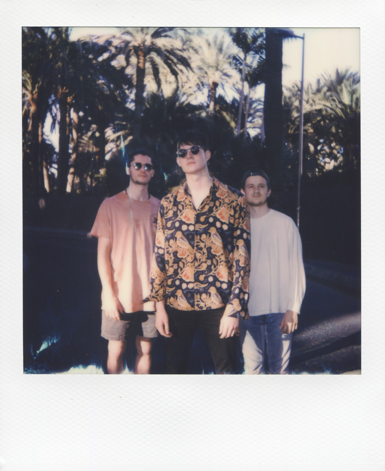 Matt Hitchinson caught up with Cassia before they opened Dot To Dot Festival 2018, and spoke about their festival experiences and their upcoming tours! How are you all feeling your set at Dot To Dot later today? Rob (Vocals and Guitar): We’re all psyched! J: We’ve never played at The Ritz before but we’ve got it booked for a headline show later in the year as part of a tour so it’ll be good to test it out. How does this compare to other venues that you’ve played? Lou (Bass and Vocals): Its bigger! J: That means the sound will be a lot different because we’re not used to this sort of echo or how reflective it is, I found in sound check that I was relying my monitor a lot rather than just the sound of the other guys. Does it feel like a natural progression for you to be making the step to bigger venues now or is it quite surreal? L: It feels quite natural – maybe that we’ve skipped a step but that’s just the sort of risk you have to take in your career and just hope it pays off. R: … even though if you rewind as little as four months then this would have seemed crazy. Thats around the time when I first heard your music: it’s been pushed a lot by Radio 1 and shows like Made In Chelsea, what is it like to have that support? J: When we first got played it was mad, I was sat in my car waiting and it was just a sick moment! L: We’re so lucky to get the help we did from BBC Introducing Stoke, particularly Rob Adcock if I’m right, those guys are absolute legends. J: Theres something surreal about it in that you can’t measure what this sort of thing is doing for you as a band but then all of a sudden people started to know us and our songs and were singing along at festivals and stuff like that, it’s all a bit mad. R: Yeah, we actually seem to have fans now – seems weird to say – and that’s always good as an artist. How does travelling between the cities over the festival work, are you planning to share the journey with any other bands? R: Nah, just a singular van for just us. L: I used to be the driver, which I hated, but we’ve managed to rope in a tour manager to do that for us recently. J: It works well because we’re such a small band; theres plenty of seats and a massive boot so we have all we need. R: The dream is to get a sleeper! L: We’re aiming high as a band [laughs] It’s not really a dream, more just excitement because we’ve managed to sort one for our upcoming tour in Europe. R: We’ll have to sort a driver for that though because Nick can’t do it this time, so if there’s anyone who can legally drive a sleeper bus out there then get in touch! You just mentioned it there: your European tour is coming up soon, are you excited for that? R: Absolutely! It’s our first headline tour outside of the UK, so there is a bit of a buzz around it for us. M: I flew out for the second half of the last one – Hamburg I think – and it made me so excited, these guys have played every gig at the same high level for ages and that’s just testament to Cassia as a band and as a great group of lads. We’ve got a sleeper for this one as well so I’m definitely coming! M: You don’t need to worry about that, Cassia always sell tickets! L: The German crowds were amazing last time we were there it’ll be great to go back. ‘Movers and Shapers EP’ came out recently, as well as a couple of singles – are the shows based around that or is there some new music teased as well? J: A bit of everything really: we’ve got the new EP, stuff from the old EP and then a bit of unreleased material as well. R: It’s a bit of something for everyone really. You’re only twenty minutes away from your set now, any last minute rituals to do? R: No, we’re not really like that, I just sort of feel like we should keep it like every other day – if we play to that level every day and treat every day the same it helps cut out any nerves. That really works with big shifts like today in a new venue for us and a much bigger venue than we’re used to. Who are you most excited to see at Dot To Dot today? And do any of the acts make it to your touring playlist? L: The Horrors definitely! It’s my birthday tomorrow so we might save a few of the bigger bands for that, make it a good day! R: I’ll be honest I don’t even know who’s playing today! J: Pale Waves, we’ve seen them in the streets today so we’re excited for them; Ady Suleiman is pretty cool too. M: We’ve sort of got a sister band that I manage as well called Larkins, so I’ll try to drag the boys along to see them. L: As for the tour playlist, theres not a lot going on, probably just the new Arctic Monkeys album – not had a lot of chance to listen to it yet. J: I’m a proper ‘pat-pat’ drummer, I’ll just drum against anything so they’ll need something to drown me out! 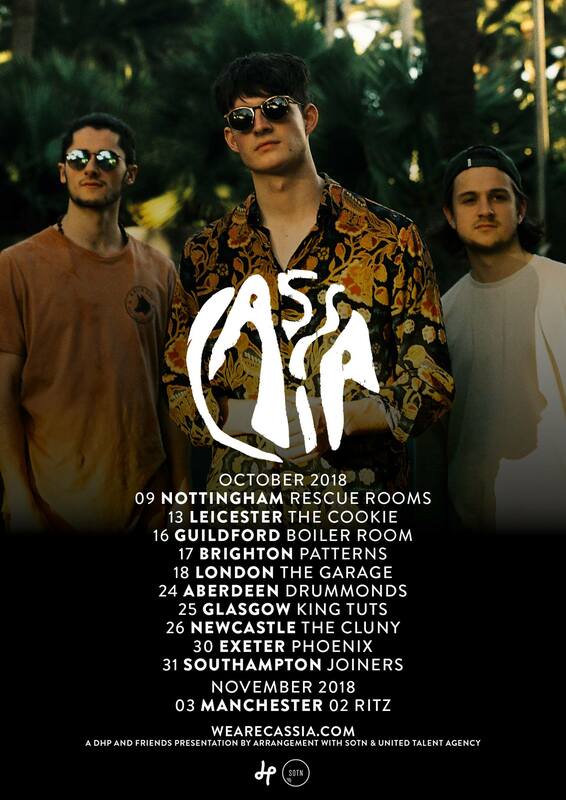 Cassia’s new single ‘Loosen Up’ is out now, and tickets for their UK tour are available here! Next articleTrick or Treat: Which is the Best Halloween Media?